Understanding PM toxicity to prevent its adverse health effects requires development of better sampling techniques. The innovation of the Aerosol to Hydrosol Air Sampler is a transformational technology that uses concept of converting airborne particles directly into the liquid phase for efficient collection and online analysis of chemical component. The paradigm shift allows novel application to the online analysis of toxic heavy metals at high time resolution for industrial emission monitoring. Currently, heavy metals pollution in air, soil and water are an alarming issue in Asia due to emission of metal containing pollutants from industrial sources. Airborne metals, due to their active role in affecting our ecosystem and public health, are especially important to monitor and control in China’s twelfth five year plan. 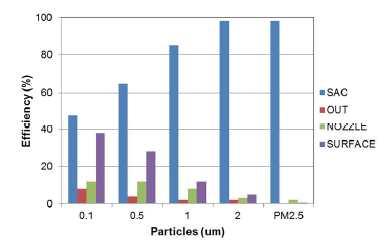 However, the lack of technology for online monitoring of toxic metals in airborne PM2.5 is an important limiting factor. Figure 1 shows the schematic diagram of Aerosol to Hydrosol Air Sampler (ATHAS). To evaluate the sampler performance, monodispersive particles were used to determine the size dependent collection efficiency of the sampler, covering the size range from 0.1μm to 2μm (0.1μm, 0.5μm, 1μm, 2μm). Laboratory aerosol was also used as surrogate PM2.5.